Happy Mermaid Monday! My husband came across a picture of “Mermaid Toast” and knew I would love it. He was right. Once I saw this magical Mermaid Toast I had to make my own. Here’s the thing, I’ve recently switched my already complicated diet (gluten free vegetarian – no eggs) to a keto, high fat low carb version. If bread and toast weren’t a problem before, it sure is now! Fortunately, this kitchen witch loves to experiment, and I set out to make keto, egg-free bread from this recipe here. 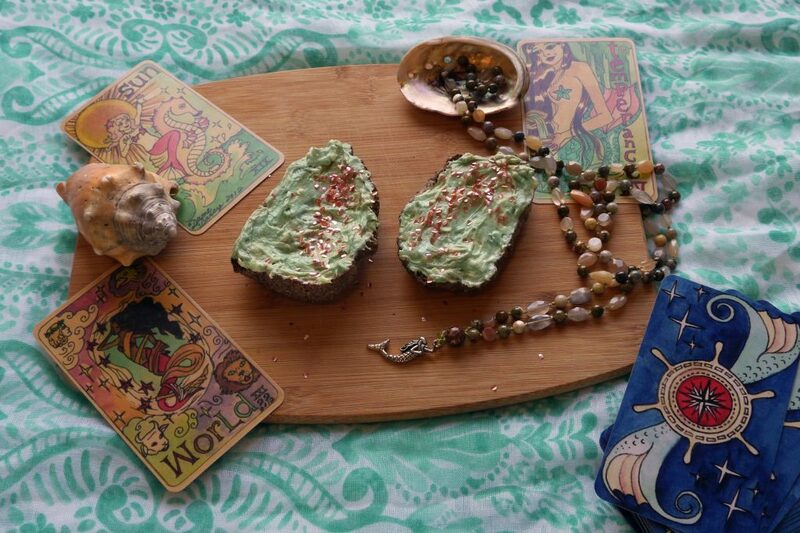 Mermaid Toast and Mermaid Tarot! I think it came out alright. But the best part is the cream cheese! Since this is Mermaid Toast and is supposed to be magical, I didn’t stop at cream cheese. I made cream cheese frosting! Probably the best kind of frosting on the planet. The color comes from blue-green algae from lake Klamath in Oregon. I put the powder in the frosting and mixed it in, getting this beautiful sea green color that I’m obsessed with. (If you’ve seen my Instagram, then you know my desk has sea green everything.) Then I added some shell pink metallic sparkles to make it extra magical and mermaid-y. Then, I added some super magick to them by offering them to my Deities. The results— delicious! Look for the recipe at the bottom. Just look at that sea-foam green frothy goodness with the shell pink dust! Dame Darcy’s Mermaid Tarot and Magical Mermaids and Dolphins Oracle reading— just keep swimming! This card tells us that whatever turbulence we’re experiencing is coming to an end. The seas are calm, the clouds are parting, and the wands line up with purpose. Be clear in your focus and hang in there! The work might not be quite over, but the storm is. Just keep swimming. This card reinforces the Eight of Wands. It tells us that the worst is already over. We might not be done quite yet, but the hardest lessons are past. This is a time to release unnecessary things, such as anger or resentment. Examine what is confronting you and let those lessons sink in, then move on. Don’t dwell on them, because great things are to come! Using a fork or electric mixer, combine butter and Lakanto Monkfruit Sweetener until slightly fluffy. Add cream cheese and vanilla and continue to mix. Break open a Klamath Blue Green Algae and add to the frosting. Keep adding the algae until you get the color intensity you like. Spread on toast of your choice (or cupcakes!) and sprinkle with Shell Pink Edible Glitter . This recipe is gluten-free, vegetarian (can be made vegan with vegan cream cheese and vegan butter), sugar free, and keto-friendly! Take a picture and tag me on Instagram (@the_raven_and_the_lotus) so I can see your creation! I hope you have a wonderful, magical week! 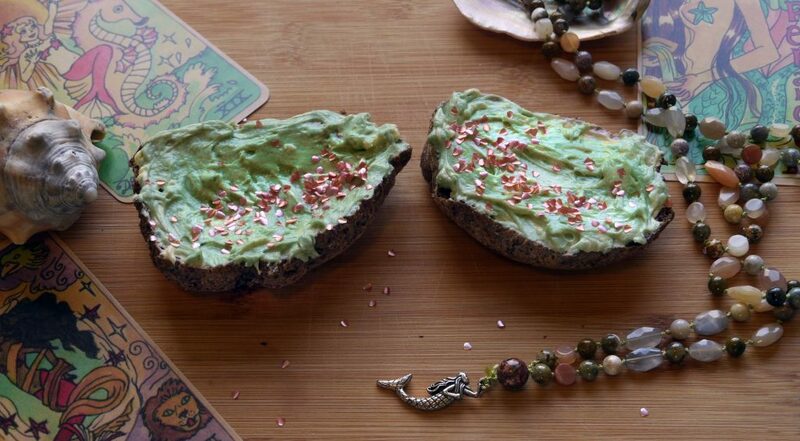 Have you made Mermaid Toast? Let me know! Thanks for linking to my roll recipe! This is by far the best use for it I’ve seen! And that reading was so reassuring. I keep forgetting mercury is in retrograde and that I need to work on being patient and calm while trying to communicate! 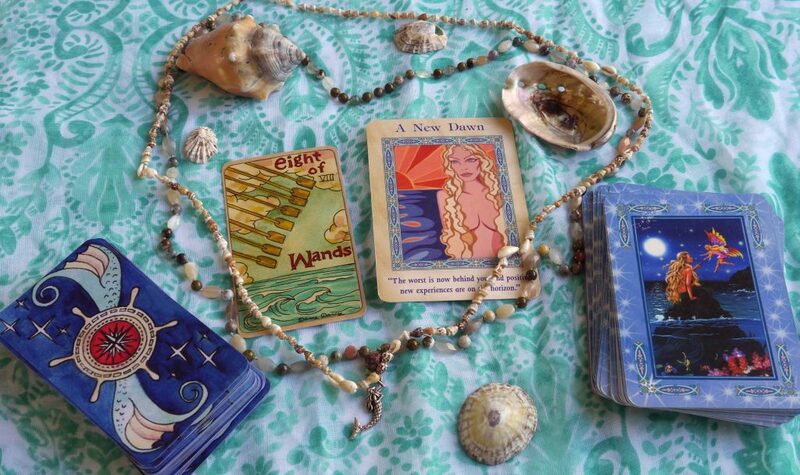 Doreen Virtue’s mermaid deck looks great – I think you’ve inspired me to add it to my collection! 😀 I love the mermaid oracle. It’s worth having! This is very cute! I too have been keto-ing for about a year now for medical reasons. It’s so worth it. 🙂 I tried it and it really helped me kick a sugar addiction, but it isn’t for me long-term. I still make a lot of the recipes I learned though! I did keto for a while. It really helped me kick a sugar addiction, but it isn’t a long-term thing for me. I still make a lot of recipes from meatfreeketo.com though!